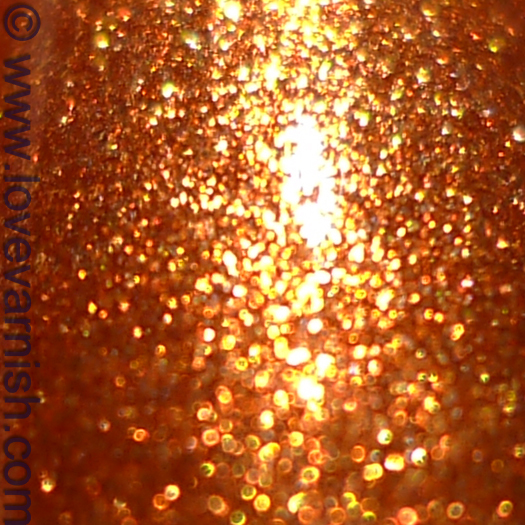 Love Varnish: OPI Euro Centrale - My 4 Picks! 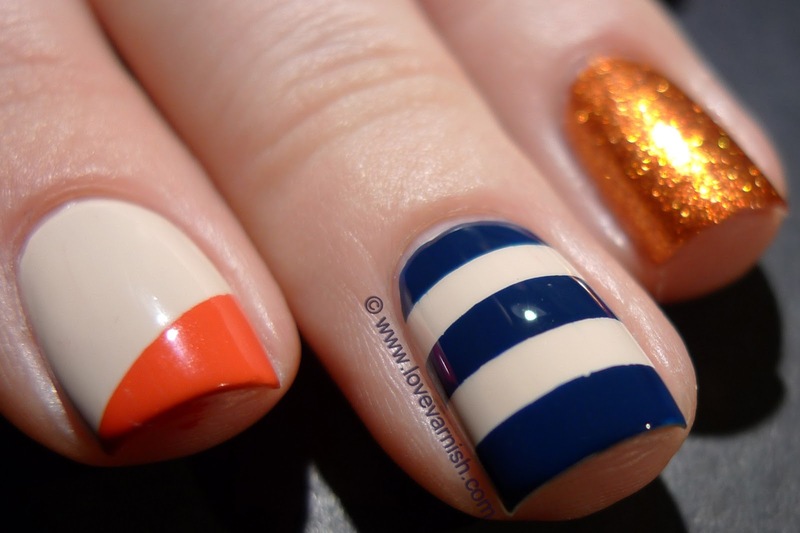 OPI Euro Centrale - My 4 Picks! Hi loves! Recently I was offered the option to pick 4 shades from the OPI Euro Centrale collection for review. I already was eyeing some but just didn't get to purchasing yet. Obviously I immediately took the opportunity to pick my fav's and show them to you! Now since the collection has been out for a while now, I didn't want to do a regular swatch and review post. So, I used all 4 shades in 1 manicure so you can see what fun things you could do with them! If you are looking for a place to purchase these or other nail care products, you can take a look at Littlewoods. 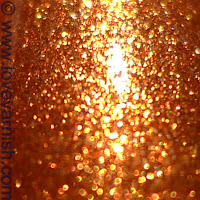 Now, my picks are My Vampire Is Buff (LOVE this shade), My Paprika Is Hotter Than Yours (bright! ), I Saw.. You Saw.. We Saw.. Warsaw (very pretty blue) & A Woman's Prague-ative (sparkles ♥). I'll describe the manicure from nail to nail to you. Thumb - OPI My Vampire Is Buff (3 coats, applied okay - a bit streaky because of the pale color) and an angled french tip with OPI My Paprika Is Hotter Than Yours! (1 coat, applied very easy). Index - OPI My Vampire Is Buff (3 coats, applied okay - a bit streaky because of the pale color) and an angled french tip with OPI My Paprika Is Hotter Than Yours! (1 coat, applied very easy). Middle - OPI My Vampire Is Buff (3 coats, applied okay - a bit streaky because of the pale color) and taped stripes with OPI I Saw.. You Saw.. We Saw.. Warsaw (1 coat, applied very easy). Ring - OPI A Woman's Prague-ative (3 coats, bit sheer but no application issues). Pinky - OPI I Saw.. You Saw.. We Saw.. Warsaw (2 coats, easy application) and polkadots using a small dotting tool and OPI My Vampire Is Buff. So, I reeeally loved all nails in this mix, the angled french is so easy but so much fun, and polkadots are never a wrong choice. 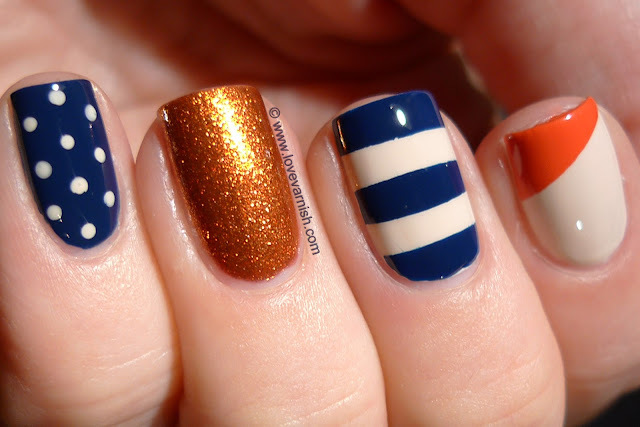 What is your favorite nail? And what is your favorite polish from the OPI Euro Centrale collection? This is lovely. A really fresh take on this collection, the mix of colors is fantastic! They all look so great together. Wonderful job! Haha, strangely enough, I did not like any of your picks. I love how you combined your picks! 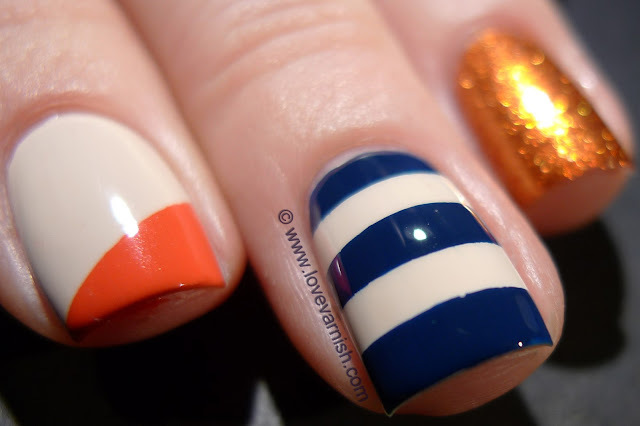 Really pretty mani! Thanks Erin, that's a very sweet compliment to me - I love showing something "different"! Thanks so much Meghan :). Haha I am glad you will still visit me ;-). Did you like others from this collection? Ahhhhh; love, love, love your mani!!! I really like the colours together and all the different designs! What for a very nice idea!!!! Love the whole nail art combo *__* I skipped this collection, but the blues are lovely and My Vampyre is Buff too!